**Remodeled-Oct 2018** 7th Floor Ocean/Beach View w/ Sleep Number bed & XBOX. ** REMODELED Sept-Oct 2018**. Unit #759. We have completely replaced our Kitchen by removing the wall to open it, all new custom cabinets, quartz countertops, new appliances and flooring. In the bath area, new vanity cabinet, quartz countertop and removed the tub to install a beautiful new walk-in shower with sliding glass doors, new flooring and carpet throughout the unit. We still have our signature Sleep Number bed, large L-Shaped sofa/queen sleeper, entertainment system with bluetooth, DVR & Xbox One (along with controllers and a couple games) in both the living room and bedroom. Our side of the tower is the south side/sunny side. This provides us with lots of beautiful natural sunlight throughout the day, plenty of space between our tower and the Westin hotel for privacy so you can keep the new drapes and blackout curtains wide open day or night. All our new kitchen lighting provides flexibility to light the kitchen as much or little as you need. The new floating ceiling light system is completely dimmable as well as the bar lighting. We also have under cabinet lights. USB outlets in kitchen and vanity along with two charging stations on desk and bedroom dresser for your electronics. Our new walk-in shower has a higher shower head with an additional magnetic handheld massager. There is an automatic moisture sensor for fan that detects when to pull out the extra moisture during showers to help keep towels dry and easier to towel off. We installed an automatic nightlight in the bathroom so you don't need to turn lights on in the middle of the night. Enjoy soft Hawaiian music at sunset while you relax on our lanai with our two binoculars. Come experience our new and improved #759! What makes our unit unique? We have a Sleep Number bed. You can control the firmness of each side of the California King bed! We also have a new XBOX in both the living room and bedroom along with 2 controllers each. 3. 1,000 square feet of space and our extra long lanai/deck overlooks the Whaler's Village next door which offers a variety of restaurants, shops, and activities. 4. Our lanai/deck has two chaise lounges and a cocktail height table and chairs so you look OVER the railing not through it. 5. Big Screen 4K HDTV in living room and HD flat screen in the bedroom with sound bar. 6. 4K XBOX & DVD player & DVR cable box (Digital Video Recorder) in living room & bedroom with Netflix/Hulu/Amazon account online access. 12. Beach chairs, umbrellas, boogie boards, snorkel gear and beach toys are in the unit for your use. 15. We've made it our home away from home in the heart of paradise, and we hope that you will find that it is also a place for you to share a romantic getaway or a relaxing family vacation. We have been visiting Hawaii for decades as a family. We were very excited to purchase this unit to share with others and continue to create more memories as our family grows. We have always enjoyed what Maui offered and the Whaler is located in the perfect spot to have access easily just by walking. One thing we felt was important is that the beach area in front of the Whaler does not have coral or rocks. We think that was a plus for us and guest to safely enjoy the surf. We have a Sleep Number bed shipped over from California. So our mattress will meet everyone's favorite firmness to feel just like home. We now have a new XBOX in both the living room and bedroom both with 2 wireless remotes. Watch your favorite movie via your own account on Netflix or Hulu, enjoy a DVD movie or play a favorite retro game that we have in our unit. Bring your own favorite games to unwind after a busy Maui day in the sun. We have two safety bars for our walk-in shower that has a regular shower head and a hand held shower massager. There is a built-in seat in the shower. For easy nighttime maneuvering, we have a built-in nightlight in the toilet/shower room so you don't have to turn lights on to get away. Air Conditioning can be controlled in the living room and in the bedroom. FREE-High Efficiency Washer and Dryer located on every floor next to the elevator of each floor. They are rarely used, so very easy to access. Parking is included in the $25+tax per day Resort fee fee paid directly to the front desk. This rate is controlled by the Board of Directors of the Whaler & can be changed without notice. Yes. There is parking inside and in the underground parking area. Bath towels provided in the unit and beach/pool towels are provided at the pool. Fitness Center usage is included in the $15 per day Parking/Amenities fee paid directly to the front desk. This rate is controlled by the Board of Directors of the Whaler and not by the Owner. we have a huge basket of reading books for you to help yourself. XBOX - we have a couple retro games available or you can bring your own. Unit exceeded all our expectations - we had 2 kids, 3 & 8 and they had a blast. From beach views, walkable distance to the beach, pool amenities, board games, beach gear in the unit, well stocked kitchen to more! Thanks, Julie! Loved it. Condo has a great view and everything you need! High end unit in the prime location - Julie has thought of everything you could want! My wife and I have been traveling to Maui every winter for almost 30 years now and have been fortunate to stay in a few different units in the Whaler - with relatives and/or other rental units. So, we've had a little experience with what is available in the Whaler. With that said, unit 759 is truly exceptional! From the first contact, Julie was super easy to work with, making sure that we knew what to expect and who to contact if there were any issues (which there weren't). The unit was recently remodeled and we could tell as soon as we opened the door. New appliances, cabinetry, countertops, etc., give the unit a nice feeling of high quality, high end accommodations. Even the dishes and cooking utensils are much better than we have experienced in other rental units - they are very nice and look to be brand new. And when you read about how Julie has thought of everything you might need, it's absolutely true. Let me just list a few items: Tommy Bahama beach chairs (like new condition), beach coolers, a LOT of snorkel gear, beach games and toys, indoor board games, decks of cards, every kitchen appliance and/or device you might think you will need (blenders, toasters, etc. ), two sets of great binoculars for watching the whales right from the lanai, a really good bluetooth sound system, high end TVs, charging units equipped to handle a LOT of devices at once (why don't more people think of this?). And the sleep number bed is great! We have one at home so it was great to feel as if we were sleeping at home the entire time we were there. And when you are trying to adjust to Hawaii time when coming from the mainland, a comfortable bed is really important! And of course, the location is ideal. 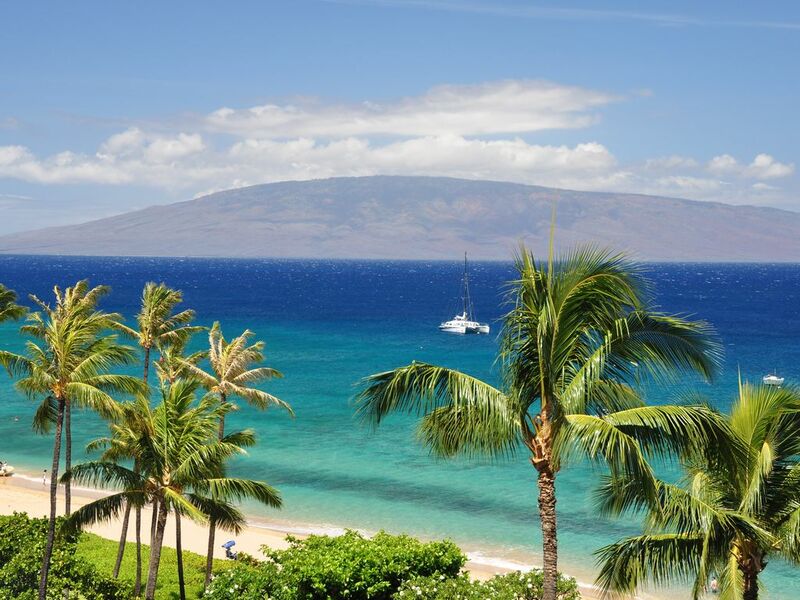 There is no better place to be on the island (or maybe the world) than right on Kaanapali Beach, next to Whaler Village shopping and a stone's throw from the Hula Grill and Leilani's beachfront dining. So many things are walkable from here - shopping, dining, golf, snorkeling, swimming, and tour boats that pick you up right on the beach (waves permitting) - no need to go the Lahaina marina to get out on the water. It's truly the hub of so many great activities. So, if you're looking for a really nice unit, right on the beach in the middle of all the action, I'm sure you will be happy with unit 759. Enjoy! This was our 4th visit to Maui. Maui is a special place and one of our favorites to visit. Without question...best accommodations we have experienced. The Whaler at Aston Village, condo #759 is the best. Maui never disappoints but the weather this year was exceptionally fantastic! Thank you Julie for sharing your home with us for the week. We look forward to returning and will request this condo. Your contact with us prior to our trip was much appreciated. Thanks again for our personalized welcome note and follow up after the trip. I would highly recommend your accommodations to anyone planning to visit Maui. If Only We Could Purchase This Unit!!!! This unit has amazing Ka'anapali Beach ocean views and equally beautiful mountain views from the sunny lanai. The spacious living room is comfortably furnished and the bedroom has plenty of closet and drawer space, and sleep comes easily in the Sleep Number bed. The newly redone bathroom has an enormous shower with a wonderful massaging shower head. The newly remodeled kitchen is fully equipped and the new appliances make cooking a delight. The unit owner is wonderfully easy to work with and she treated us like family. We have stayed in several different units during our vacations at the Whaler, but the last several times we have stayed in this unit. It is far and away our favorite place to spend our "get-aways." The owner has provided everything needed to have an enjoyable stay on Ka'anapli Beach, and the countless "little touches" are too numerous to list here. We have two regrets: We do not own this unit, and secondly, we eventually have to leave and return to our snowy home. Hawaii Tax ID: #TA 072-692-1216-01 & #GE 072-692-1216-01 25% Due at booking and is non-refundable 120 days (4 months) prior to arrival 75% Balance due 90 days prior to arrival Final Cancellation non-refundable 60 days (2 months) prior to arrival Security Deposit or Damage protection and cleaning are always refundable up to your arrival date if cancelled after the 60 day cancellation date. Peak Season: $350 to $425 (Jan-April, June-Aug, Parts of Nov & Dec) Low Season: $325-$395 (May, Sept-Mid-Nov, part of Dec) Holiday rates: $425-$550 - 14 night min (Dec/Jan) Rates based on a party of 2. There is an additional fee for more than 2 guest and extra cleaning. SPECIALS: Rates are discounted +cleaning +amenities Fee for party of 2. 5 night min. Stays under 5 nights are accepted if it is for last minute or doesn't break up a stay of 7 nights or longer.